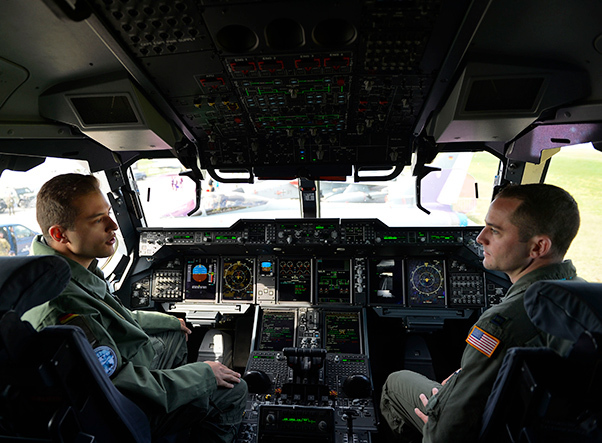 German Luftwaffe 1st Lt. Felix, an A400M Atlas co-pilot, left, discusses the capabilities of his aircraft with U.S. Air Force Capt. Tim Vedra, 37th Airlift Squadron C-130J Super Hercules instructor pilot, in Berlin, Germany, April 27, 2018. U.S. and German Airmen shared knowledge with each other concerning their respective airframes during the 2018 Berlin Air and Trade Show. When boarding U.S. aircraft during an air show, it is natural for people to expect a U.S. pilot or crew member to greet them. 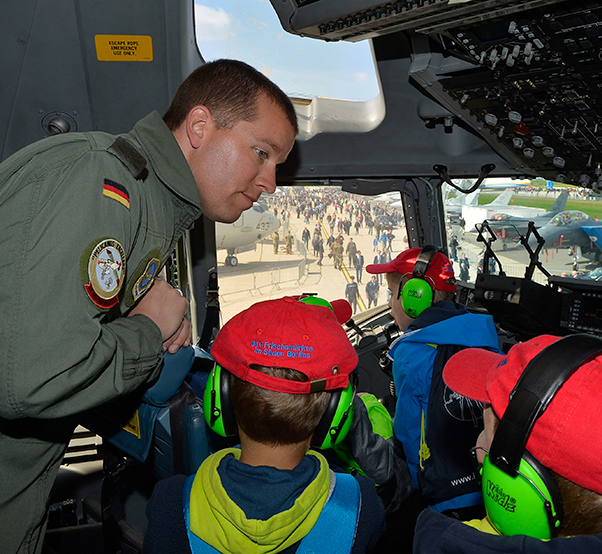 This wasn’t the case when a group of German school children visited a C-17 Globemaster III during the Berlin Air and Trade Show on April 27. Instead, they were greeted by a German pilot assigned to Joint Base Charleston, S.C. as part of the Military Personnel Exchange program. U.S. Airmen assigned to the 37th Airlift Squadron receive a briefing about the A400M Atlas from German air force 1st Lt. Felix, A400M co-pilot, in Berlin, Germany, April 27, 2018. According to aerospace corporation Airbus, there are 58 A400Ms in operation. 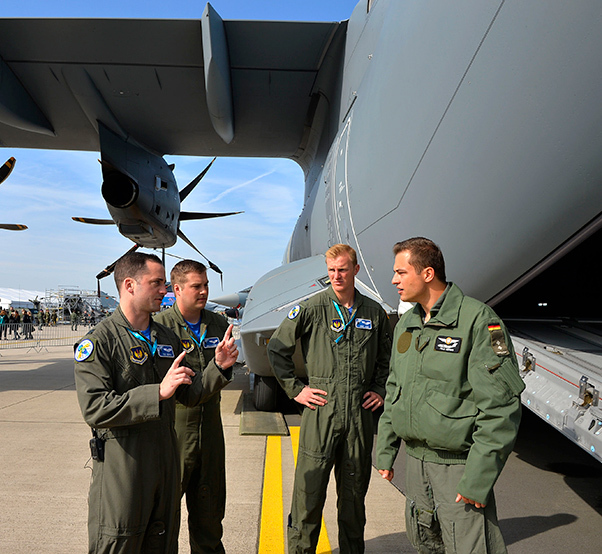 Elsewhere during the air show, U.S. Airmen from the 37th Airlift Wing met with their German counterparts from the Air Transport Wing 62, or “Lufttransportgeschwader 62.” The air show gave the two partnership wings the opportunity to socialize and exchanged information about their respective aircraft: the C-130J Super Hercules and A400M Atlas. 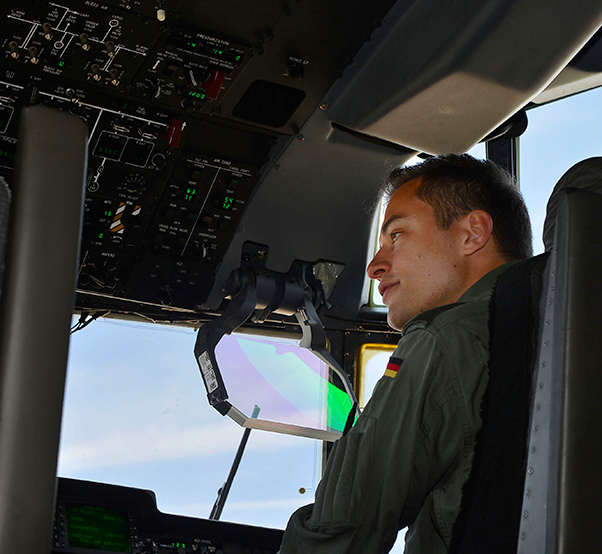 First Lt. Felix, an A400M co-pilot, said he was also impressed by the versatility of the C-130J. He expressed desire to see the A400M and C-130J to fly together in a mission. German Luftwaffe 1st Lt. Felix, sits in the cockpit of a U.S. Air Force C-130J Super Hercules in Berlin, Germany, April 27, 2018. U.S. and German Airmen met with each other to share knowledge and experience concerning their respective aircraft during the 2018 Berlin Air and Trade Show. Master Sgt. Martin, an A400M loadmaster, said that while different nations have different aircraft, there are many similarities between the duty descriptions of the aircrew. German Luftwaffe Maj. Rico Persy, a foreign exchange pilot stationed at Joint Base Charleston, S.C., shows German school children the features of a U.S. Air Force C-17 Globemaster III in Berlin, Germany, April 27, 2018. The Military Personnel Exchange program allows U.S. and foreign pilots to train train closely with their allies and familiarize themselves with other aircraft. Martin added that exchanging ideas between allies can benefit both parties involved. 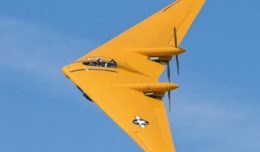 If loadmasters from a certain airframe see crewmembers from a different aircraft use techniques which work for them, the former might be able to incorporate those techniques into their own and vice versa, Martin said. 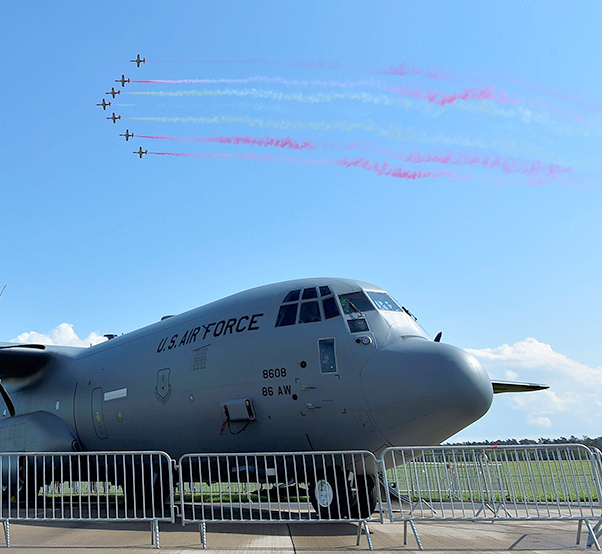 A Spanish aerobatic demonstration team flies in formation while a U.S. Air Force C-130J Super Hercules from Ramstein Air Base, Germany, sits on display during the Berlin Air and Trade Show, April 25, 2018. The Berlin Air and Trade Show provided a medium for U.S. and allied nations to exchange information and enhance interoperability.